Two fundamentally differing visions of the origin and destiny of the United States were recently set forth before the American people. In a February 24 speech (video, text as prepared for delivery) to a joint session of Congress, Barack Obama advanced a program that sometimes employs the language of liberty but whose worldview dynamics and real-world impact submit Americans to a secularist plan that is centered, driven, and empowered by Washington, D.C. 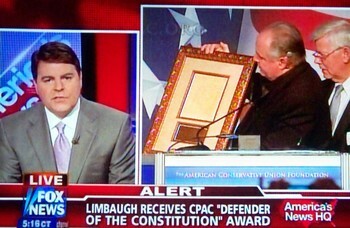 In a February 28 speech before CPAC 2009 (Conservative Political Action Committee) in Washington, D.C., Rush Limbaugh argued for progress based on a Constitutional and Declaration vision. This vision asserts the superiority of the Creator -- and of a free people liberated by that Creator -- over the power structures of this world, whether those systems are led by kings, presidents, revolutionaries, or some other kind of arbitrary, sociological elite. A transcript and video of Limbaugh's "1st Televised Address to the Nation" are available here. As I see it, Limbaugh is "speaking directly from the philosophic core of the defining vision of the U.S. That liberating and humane core is what separates us from the Greeks, Romans, French Rev., Hitler, Stalin, and modern post-American liberalism and its secularist Washington-centrism" (comments from a Facebook discussion). Further elucidation on the superiority and humanity of a federal republic secured by the Constitution and energized by a Delcaration vision is available here ("Steamroller: Obama May Revoke 'Conscience Rule'"). An article-length treatment of these themes is available in "O'Reilly, Letterman, and the Culture War."